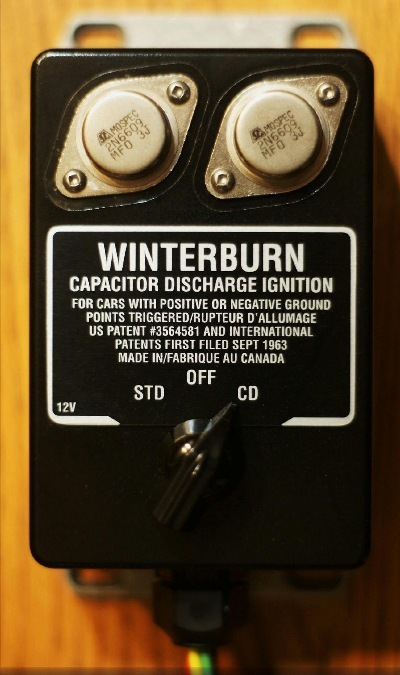 The Winterburn Capacitor Discharge Ignition System was the very first commercially successful solid-state CD ignition designed by the late Lloyd Winterburn (RCAF electronics expert and pilot) in 1962. It solved the problems that had plagued earlier design attempts and became the most copied design throughout the 1960s and 1970s. The first production units were manufactured by Hyland Electronics of Ottawa Canada in early 1963. Many Hyland ignitions are still functioning more than 50 years later. 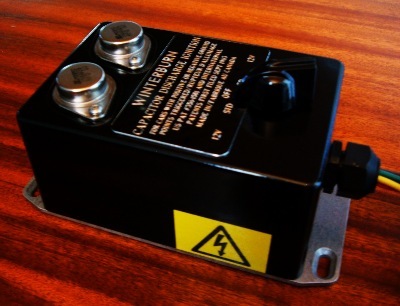 The Winterburn designed CD ignition is being manufactured again by Lloyd's son, Fred Winterburn, in small quantities with 12V and 6V models available. All units are hand built utilizing high quality components with high voltage and current ratings. The power supply transformer, which is the heart of the unit, is wound by hand to exacting standards (a time consuming process). Each unit contains over $130 CDN in parts and takes in excess of 6 hours to build. The design retains the basic elements that worked so well on the Hyland, but with a long duration multiphase spark. It is compatible with positive or negative ground cars and hookup is exactly the same regardless of the polarity. For example, if one is installed on a positive ground car and the car is converted to negative ground at a later date, no changes are required. The CD circuitry will automatically adjust to the new polarity. There is an o-ring sealed switch provided to revert back to standard (Kettering) ignition if need be. There are very good reasons why this CD ignition is intended to be triggered by distributor points. When points do not have to break the heavy current of the Kettering system they will last a very long time, often in excess of 60 thousand miles providing the rubbing block and distributor cam are lubricated occasionally. The points are not voltage sensitive as they are a simple mechanical switch. This allows the Winterburn CD power supply to provide almost full spark energy down to *3.5 volts(6V model) to start a car with a weak battery. This is true for any car with points regardless of manufacture, as points do not have a threshold voltage requirement as do some other triggers. The CD circuitry cancels the effect of points bouncing upon closure, so despite still being present when triggering the CD ignition, high engine speeds are possible without spark scatter. This ability was a key feature of the original Winterburn patent. Finally, retaining the points gives the redundancy of two types of ignition systems. If the CD fails (very unlikely), or troubleshooting is required, the ability to switch easily from CD to Kettering is a boon. The switch is provided to make that easy. The switch also has a centre 'off' position. 6V models will provide a healthy starting spark (approximately 22kV) down to 3.5V battery voltage, and 12V models will provide the same at 5.5V when using a conventional coil. 12V units can be triggered by Pertronix/Aldon Ignitor (ask for instructions as the Pertronix hooks up differently, and only the negative ground Pertronix is a suitable trigger). 6V units can be triggered by 6V Pertronix/Aldon, but it is not recommended due to the high minimum voltage requirement of the Pertronix/Aldon. 12V and 6V units can be triggered by 123 brand electronic distributors. The Winterburn CDI is voltage controlled to limit insulation stress to vintage ignition components. It's current (amperage) that lights fuel, not voltage. Spark power is controlled to ensure spark plugs and high voltage contacts have life expectancies exceeding those of today's automotive ignition systems. Excessive spark energy with high peak spark power, can wreak havoc with stock ignition components and this is a problem with most* high energy CD ignitions on the market today. The Winterburn CDI strikes a balance such that stock components last longer than with the Kettering system, while greatly increasing performance. This ignition system provides high power to fire wet, gasoline soaked, or carbon fouled spark plugs. Testing with a shunt resistance of 126 thousand ohms bridging the spark gap to simulate a severely fouled spark plug, reveals the Winterburn CDI provides more than ten times the spark voltage than if the same ignition coil is used in the conventional manner (Kettering or Transistor switch). With a shunt resistance of 625 thousand ohms simulating a less severely fouled spark plug, the unit will provide up to double the spark voltage compared to Kettering or Transistor Switch systems. This feat is accomplished with a total available voltage slightly less than the Kettering system or Transistor switch systems. It's this near immunity to shunt resistance that means the difference between a flooded engine (Kettering or Transistor switch) or an engine that starts on the first compression (Winterburn CDI). Cold weather starting is vastly improved, and as a bonus, some cars that are notorious for hard starting after being run in hot weather, start more easily with this ignition system. To put this in perspective, with modern engines having very high energy inductive ignition systems, and much higher available voltage, plug fouling is said to begin at about 10 million ohms shunt resistance. If the shunt resistance drops to 1 million ohms, the affected cylinder will misfire continuously. With this CD ignition, an engine will run without misfires with a shunt resistance of 1 million ohms. Efficient power supply design means very little heat generated by the unit itself and power consumption is very low. 12V units consume 3 amps at 8000 rpm on an eight cylinder car, and 6V units consume 4 amps at 7200 rpm. With a CD ignition, current draw increases with RPM which is the opposite of the Kettering system, so power is only used when it is required. A four cylinder engine driven briskly with a 12V Winterburn CD will average just over 1 amp current draw. This makes it ideal for cars with small capacity charging systems and prolongs the life of the contacts in the car's ignition switch. Despite the low current draw, the power output is still very high. This is undoubtedly the most efficient CD ignition on the market today. Gains in efficiency, and spark duration, are accomplished by tuning the circuit to match most standard production ignition coils. The CD power supply, in addition to its primary function of charging the CD discharge capacitor between spark events, also provides extra energy during the spark period which prolongs the natural resonance, and hence spark duration. The Winterburn CDI has a long multiphase spark up to 0.5mS long depending on the ignition coil. The canister style coil that is already on your car is a good choice. It is perfectly acceptable to use a coil with high primary resistance (up to 3.6 ohms) as the reduction in spark energy is less than 7% over a coil with 0.7 ohms primary resistance. Reliability: Torture testing has proven that any of the failure modes for which other designs are susceptible, do not damage the Winterburn CDI. -The dual polarity feature makes it almost completely immune to improper hook-up *See note 3 below. -The novel power supply design unique to this model, limits the voltage output to prevent damage to the SCR and other voltage sensitive components should the car's voltage regulator fail and drive the supply voltage excessively high. This is done without any extra components that would complicate the circuit and create potential failures in themselves (no zener diodes or conventional voltage regulation methods are employed). This was a mandatory design feature for the 6V unit should it be connected to, or boosted from a 12V source. It also benefits 12V units. -In common with the old Hyland design, the power supply also reduces its power output once the load increases beyond a certain point. -Units have been tested with the output dead shorted for hours without damage. (Bosch units and others fail in short order when this happens). -Simulated tests of coils with secondary windings shorting to the primary winding do not result in damage to the CDI. -No electrolytic capacitors are used; only film types with high temperature, voltage and moisture ratings. -Some CD ignitions are notorious for generating excessive heat and require cooling fins to dissipate that heat. The Winterburn Ignition generates very little heat even at the highest possible engine speeds. -The Winterburn CDI is not potted. This allows it to be repaired in the unlikely event that is required. Since the unit is not potted, any components vulnerable to vibration are further supported with a special long lasting adhesive. Retaining a robust analogue design, utilising standard discreet components rather than specialized integrated circuits, ensures continued parts supply long into the future. The Winterburn CD Ignition will give results that points replacement type electronic ignitions can't, such as Pertronix, which are modern day transistor switch ignitions. (It will also yield results that a poorly designed CD ignition can't either!) A properly built CD ignition cannot be hidden within the confines of a distributor. The size of the discharge capacitor alone would be a tight fit. (The unit measures 5-5/8'' (15cm) long at the base plate, by 3-1/8" (8cm) wide, by 3" (7.5cm) high to top of switch knob). Weight is approximately 2.2 lb (1kg). Expect a minimum of 5% fuel savings with increased power and very easy starting while increasing the life of your original ignition components. An 8 cylinder car driven 5000 miles per year with the Winterburn CDI can be expected to pay off the initial cost in a maximum of 4 years at today's fuel prices. That doesn't factor in the increased reliability, throttle response, and reduced engine wear from complete combustion. The Winterburn long duration CDI comes in a 'splash resistant' cast aluminum case painted with four coats of high temperature engine paint over two coats of zinc chromate primer. The base is natural aluminum. The aluminum nameplate is now done with the Aluscreen process for durability. Current production includes two colours; bright yellow and black. It is designed to look 1960s retro to augment the underhood appearance of classic cars. It can be hidden if that is desired. It will operate properly with any type of ignition wire and is compatible with resistor spark plugs. It will also trigger RVI(Smiths) and voltage sensing tachometers without a special tach adapter in most cases*. Enquire for compatibility or I will ask what you have for a tachometer if you don't ask first! Exceptions noted to date that require an adapter: early Fiat Spiders, Porsche 356 with electronic tach (in house adapter available as special order for modest fee, but lead time to build required), early Mercedes 350SL: adapter for those can be found at: http://www.ashlocktech.com/Home.php The MSD 8920 adapter works well in most other applications. *The later style Smiths RVI with the sensing loop internal to the tachometer (single transistor type) may require a conversion to the voltage sensing type to be compatible. The early two transistor Smiths RVI current sensing tachometer (external sensing loop) can be made to work easily with the addition of a $2 bridge rectifier in the tach circuit. 1. 3% to 4% more HP over most of the RPM range over points or Pertronix on mildly tuned engines. More with performance engines. *See note 1 below. 2. Improved throttle response (power delivery more immediate when pressing the accelerator pedal). 4. No power loss at high RPM. 5. Useful spark duration is long enough to fire even very lean mixtures unlike most CD ignitions. Most multi-strike CD ignition systems have spark durations of between 35 and 100 micro-seconds. The useful spark duration of the Winterburn system in the worst conditions is never less than 350 micro-seconds. 6. Cold and Hot starting much improved. The nature of the Winterburn CD power supply is such that the voltage output for starting is almost independent of battery voltage, so that on 12V systems an engine can be started with nearly full spark energy down to 4.5V (3.2V on 6V models). (Most CD ignitions sold today do not have built-in compensation for low battery voltage, so the CD output voltage drops in proportion to battery voltage). 7. No drop off in idle speed as CD ignition resists spark plug fouling and cleans spark plugs at idle when most carburetted engines tend to run slightly rich. (you may have to reduce the idle speed slightly with some engines, as the faster growing flame kernel results in a more stable and consistent flame front). With fewer misfires and more consistent combustion between cylinders, idle is smoother too. Superior running in wet conditions as spark plugs will still fire with insulators completely submersed in water. 8. Spark plugs last as long, or longer than on modern cars. 9. Breaker points last over 60000 miles, and all other stock ignition components last longer than when used inductively. Standard copper core ignition wires can be used with great success unlike some other CD ignition systems. 10. A switch, (quality, USA made, and the most expensive single component of the ignition system) to revert to standard ignition for troubleshooting, setting dwell for use in STD (non-CD mode), or in the unlikely event the unit fails. The switch is 3-position with a centre 'off' position that completely disconnects all parts of the ignition circuit. This can be used to help deter theft. Note 1: In very few cases, the owner may not notice a performance improvement over a system using brand new spark plugs and other new ignition components. However, over time, as spark plugs and other components degrade from use and age, performance will not drop off nearly as quickly with the Winterburn CDi. Spark plugs last at least 5 times longer and won't foul, while high voltage insulation is protected better than with the standard Kettering system or points replacement modules. 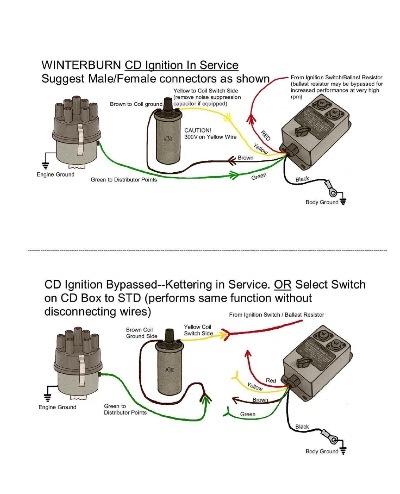 Note 2: The Winterburn CD ignition will complement your existing ignition system components and accomplish all of the above (in most cases, see note 1) with a spark superior to that found on modern cars, but it can't compensate for already failing ignition components (such as plug wires) or a worn out distributor. Note 3: Failure to follow directions during installation can result in damage to the switch on the CDI. If the supplied instructions are followed and warnings heeded, this cannot happen and the switch will last indefinitely. The current price per unit (as of Dec 2018) is $445 Canadian (approximately $340USD). I build these units in small batches of 5, and as such, there may be a short wait before more become available. You can reserve from the next batch with no down payment if you don't mind waiting. Each unit has a 25 month warranty. This year (2018) I will accept orders for a small number of AEC103 retrofits with work to begin mid September. Contact me before sending your empty case for the retrofit. Shipping of your empty case must be done as per my instructions to avoid extra charges that will otherwise go to the Canadian government. I will replace the damaged internals of your Magneti Marelli AEC103 CD ignition with a modified version of the Winterburn circuit. Provide me with an empty, restored case, and I will retrofit it with a much better circuit than it had originally, without potting so that future repair is easy if ever needed(very unlikely with this circuit). External wiring including tachometer output is identical to the original for a true 'plug and play' rebuild. Cost is $460CAD excluding shipping charges which are extra. Note: The AEC103 is the only model that I retrofit at the moment. I do not repair or retrofit any other type of CD ignition. Also, I only retrofit original cases, not reproductions. About voltage rise time: The advantage of CD ignition in firing fouled spark plugs has been traditionally attributed to a CD ignition having a very short voltage rise time, or more correctly, a fast voltage rate-of-rise. It was pointed out to me sometime ago that this only applies when a CD ignition is compared to the Kettering system that uses a condenser. When the coil primary current in an inductive system is switched by a transistor with no condenser in the circuit, the voltage rate-of-rise is comparable to when the same coil is used with a CD ignition. The condenser in the Kettering system slows the voltage rise by 1-1/2 to 3 times depending on the coil used. The opinion of the person who pointed this out to me, was that since the voltage rise wasn't really any faster with CDI, that meant that CDI was no better at firing fouled spark plugs. That would be a reasonable conclusion except that the voltage rate-of-rise with CDI is actually much faster when presented with a load. Prior to spark formation, the only load is the amount of energy required to alter the magnetic flux of the coil and a small amount of current that crosses the spark plug electrode in the form of a corona discharge. It takes very little energy to accomplish this, so the unloaded voltage rise is very quick in either case. (Compare it to a car with the driving wheels jacked off the ground. It takes a certain horsepower to overcome the friction and mass of the driveline to bring the wheel speed up to 100 mph in a certain time period. A 100 hp engine will bring it up to speed almost as quickly as a 300 hp engine will. Put the wheels back on the ground and it's a much different story). When a spark plug is loaded with fouling deposits or the electrodes and/or insulator are wet, the voltage rate-of-rise with CDI is actually much quicker than inductive systems using the same coil. This is partly because the power delivery capability with CD ignition is much higher. Recently (as of Oct 2018) I have discovered that CDI provides not only high power, but high power coupled with a leading power factor which is precisely what a spark gap needs prior to breakdown. The spark gap is initially at least, a capacitive load and as such is the preferred current path for power delivered with a leading power factor. This is the main reason why CDI is superior in overcoming shunt resistances such as fouling deposits or wet insulators. An inductive system with its lagging power factor (current lagging voltage) will prefer to drive current through a shunt resistance rather than the spark gap if the shunt resistance value isn't extremely high. Write me if you wish, for a short article describing the experiment that proved this. Interestingly, the condenser in the Kettering system while initially acting as a load that slows the voltage rise, uses that stored energy by giving it back during, and after spark formation, thus strengthening the spark. With some coils, the contribution of the condenser makes the Kettering system superior in firing fouled spark plugs than if the same coil is switched with a transistor. However, neither points or transistor switch are effective against severe or even moderate spark plug fouling. About Voltage Overshoot: It takes voltage and current to initiate a spark. The threshold voltage requirement prior to spark formation is dependent on conditions at the spark plug gap (wider gap requires more voltage as does higher fuel/air density due to compression, and other factors). However, the seldom if ever mentioned fact, is that there is always a voltage overshoot that occurs prior to spark breakdown, and this voltage overshoot varies with ignition systems. Other than conditions at the spark plug gap, the strength of the ignition system also plays a major part in the amount of voltage necessary to initiate breakdown. A weak ignition system may have to produce up to double the voltage of a stronger ignition system to fire spark plugs reliably under all circumstances. This is because it takes both voltage and current (amperage) to create a spark. To sufficiently pre-ionise the spark plug gap takes a particular amount of current that varies with conditions at the spark plug gap. If a weak inductive ignition system is used, the voltage (from self-induction) will rise much higher to provide the required current for this to happen. This explains why some weak ignition systems can degrade insulation much faster than more energetic ignitions. Not only are there more misfires that cause the coil secondary voltage to rise extremely high, even with no misfires the voltage is higher with a weak ignition system. That is, providing the weaker ignition is capable of producing the higher voltage necessary. About Free Energy: I've had several enquiries about this CD ignition from people attempting to produce systems that extract more energy than the available energy to the system they are designing. There is no such thing as free energy, or over-unity. The energy must come from somewhere. Even when an energy source is available, the energy extraction process is never 100% efficient. For some reason, CD ignition is often associated with false notions of harnessing so called free energy. F.W. If the Ignition is so good, why only a two year warranty? This is a sole proprietorship endeavor and I am not getting any younger. Should I wish to fold the business, I only want to be responsible for warranty repairs for another two years. Rest assured, that the circuit can be easily repaired (even without a schematic) long after company support becomes unavailable. Furthermore, the quality of this CDI makes the chance of requiring warranty repair very unlikely anyway. F.W. I haven't been including testimonials on this site, but I particularly liked this one and was given permission to print it here by Martin of Dorchester, (1976 Triumph TR6).